Good morning, everyone! I’m trying to be super diligent and get these Show Notes posted since I’ve slacked off on posting the last ones. On yesterday’s show we were joined by Dr. David Delaney, doctor of systematic theology and director of the Mother of the Americas Institute. Our topic was everyone’s not-so-favorite subject: persecution and suffering. But not just that, because the two essentials for enduring any kind of suffering are joy and hope. The focus was on Robert P. George’s address at the National Catholic Prayer Breakfast last week. You can find the full text of the address here, or the video here (his address begins at 15:10 in the video). These are weighty words that deserve to be read and taken to heart. 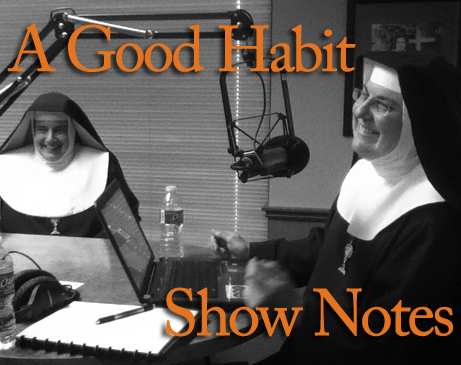 Also, on a previous episode we promised to give you the link for listening to MP3s of Fr. Mitch Pacwa’s talks on Divine Mercy which he gave here in San Antonio during the Divine Mercy SA Weekend. Those talks will be available here. Although I did not see them yet, there are lots of other great talks by Father you should check out. This entry was posted in A Good Habit and tagged A Good Habit, Divine Mercy, Dr. David Delaney, Fr. Mitch Pacwa, hope, joy, Mother of the Americas Institute, National Catholic Prayer Breakfast, persecution, radio, Robert P George, suffering by texasnuns. Bookmark the permalink.